Audrey Crites competes in Saturday’s Soap Box Derby held on the Henry J. Hawk Memorial Hill in Faurot Park. 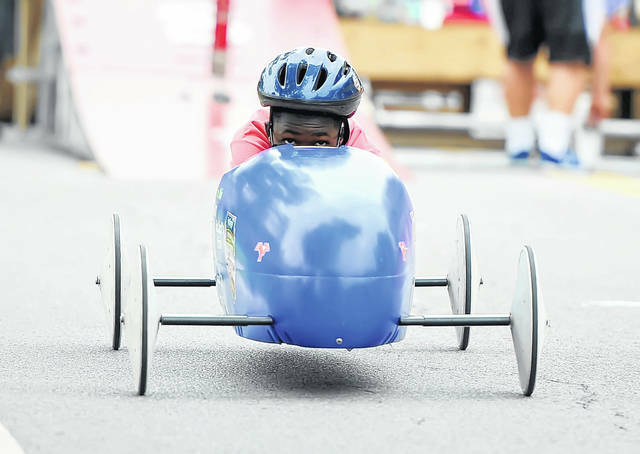 Izaiah Thompson competes in Saturday’s Soap Box Derby held on the Henry J. Hawk Memorial Hill in Faurot Park. 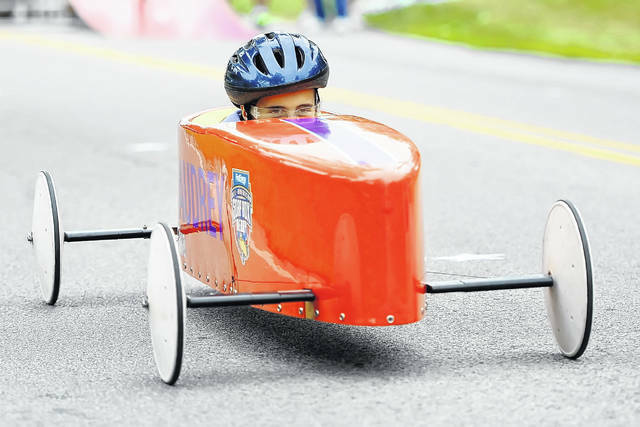 LIMA – Saturday’s 68th annual Lima Soap Box Derby featured some of the sleekest homemade cars, as 29 area youth competed for a chance to qualify for the First Energy All-American Soap Box Derby World Championships in Akron on July 21 at the world famous Derby Downs Track. There are three divisions. The winners from each division Saturday advance to Akron, where they will be joined by participants from all over the world. At Saturday’s Soap Box Derby, Emily Skinner won her third consecutive title, as she took first place in the Masters Division. Finishing second to Skinner was Ayden Crites. The Masters Division is for the older and more experienced competitors, ages ranging from 10-20. The combined weight of the car and racer cannot exceed 255 pounds. There are a total of three divisions. The Stock Division is for racers ages 7-13. The combined weight between the car and competitor cannot exceed 200 pounds for this division. The Super Stock Division is for racers that are 9-18 years of age. The total weight, between the car and competitor, cannot exceed 240 pounds. Last year, Skinner won the Super Stock Division. In 2016, she took first in the Stock Division. Saturday, she completed the tri-fecta. The 15-year-old Skinner, a sophomore at Shawnee, will be making her third trip to Akron. Competing in the Masters Division also meant the style of car would be different. In the Masters Division, the racer is pretty much laying back in their seat – a little different than the traditional style in the other two divisions, where the driver is sitting in a conventional straight-up position. “It’s a lot different, because it’s a lot harder to see, but otherwise, it’s pretty fun,” Skinner said about the car she drove Saturday. Laiken Eith, a 10-year-old from Bath, won her second title Saturday, taking first in the Super Stock Division. Last year, Eith took first in the Stock Division. Brooke Miller finished second, while Alyssa Skinner – Emily Skinner’s sister – finished third in the Super Stock Division. Audrey Crites, a 10-year-old fifth-grader from Waynesfield-Goshen, won the Stock Division on Saturday. Autumn Stechschulte finished second, while Leo Garlock came in third. The Lima race was founded in 1936, making it one of the oldest races in the country. Depending on different variables, speeds on “Derby Hill” reach up to 30 miles per hour. Steve Skinner has been the Lima race director for the past six years. Skinner said Lima has always been well-represented at Akron each year. “We’ve been doing pretty well the last couple years. We’ve had some top-10 placers. We hope to continue that,” he said. Skinner said the numbers competing in Lima fluctuate from year to year. “They (the numbers) seem to go up and down every year. Vacations tend to hurt us sometimes. And cars aren’t cheap either,” he said. Another factor in the deviation of the number of participants each year is the way the divisions are set up. Skinner said the annual event would not be possible without the much-needed sponsorship each year. The major sponsors for this year’s Lima Soap Box Derby included East of Chicago Pizza, Allan Nott Honda Toyota, Friend of the Derby, Meijer, The Grounds Guys, Able Wrecker Services, Superior Credit Union, VFW Post #1275, Eagles #370, Old Barn Out Back, Quick as a Wink Printing/Just 4 U Scrubs, Wannemacher Total Logistics, Tom Ahl Family of Dealerships, Husky Energy – Lima Refinery, Dominion East Ohio Gas Co., Jim and Lena Blair and Binkley Real Estate.